The First Judicial District Commission on Judicial Performance recommends by a vote of 5 to 3 that Judge K.J. Moore BE RETAINED with the condition that Judge Moore be placed on a performance improvement plan that holds her accountable for an increasing pattern of absences, poor time and docket management, and deficient staff supervision. 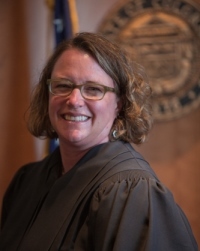 Judge Moore received her BA degree from the University of Colorado and her law degree from the Vermont Law School. She was appointed to the Jefferson County Court in 2008. Before her appointment to the court, Judge Moore was a District Court Magistrate for the First Judicial District and a public defender. Her community service includes: chair and coordinator of the First Judicial District High School Mock Trial Tournament, chair of the Court Services Advisory Board, faculty member for Colorado Faculty Excellence in Judicial Education, a member of the Statewide Behavioral Transformation Counsel and Task Force Concerning the Treatment of Persons with Mental Illness in the Criminal and Juvenile Justice Systems, a member of the Executive Board of the Criminal Law Section of the Colorado Bar Association, and the Colorado Crisis Services Advisory Council. The Commission observed Judge Moore in the courtroom, reviewed decisions, survey results, her self-evaluation and case management reports, considered information from other interested parties, and conducted a personal interview. Seventy attorneys and fifty-one non-attorneys completed judicial performance surveys sent to individuals identified as having experience before Judge Moore in 2015 -2016. In those results, we identified that some attorney respondents were not aware of Judge Moore’s identity and were responding to another judge’s performance even though, in the introduction to the survey the name and photo of each judge was displayed. While those responses were removed from the survey results we cannot say with certainty that other attorneys did not make similar errors. In the 2016 Final Survey Report, 68% of attorney’s recommend Judge Moore be retained, 14% recommend not to retain, and 17% made no recommendation. Of non-attorneys completing the survey, 88% recommend Judge Moore be retained, 4% not retain, and 8% made no recommendation. Judge Moore received high marks for her knowledge of the law, communications skills and demeanor, and for her sensitivity toward individuals with mental health problems. Despite these strong attributes, frequent absence from the bench and poor docket management continue to override Judge Moore’s effectiveness. Although the Commission understands that there have been extenuating circumstances over the past year that may have contributed to Judge Moore’s need to take time away, we are also aware of an emerging pattern of docket and time management issues beginning in 2014 and becoming a serious concern in 2015-2016. In our interview with Judge Moore, the Commission was pleased to learn that she has begun to take steps to address these issues. However, given the striking amount of recent criticism, we strongly recommend that Judge Moore enter into a supervised performance plan that aims to improve her time and docket management and minimize her absences from the bench.